A couple of years after the invention of what is now known as the Internet, Ernest Miller Hemingway died of a self inflicted gun shot wound on July 2, 1961. Today you can have the choice of creating a multitude of social media profiles, picture sites, and blogs with gadget add-on doohickeys and thingamajigs. Most offer the choice of colors and backgrounds, font choices and design options. But none will make you a better writer or contributor. There seems to be quite a bit of chatter in the blogosphere lately about the responsibility we all share as our own personal broadcasters, content providers, writers, editors and information givers and takers. Start a blog. Get in the game. Have your say. Add your thoughts. But don’t expect any of the trappings to make you interesting or entertaining. 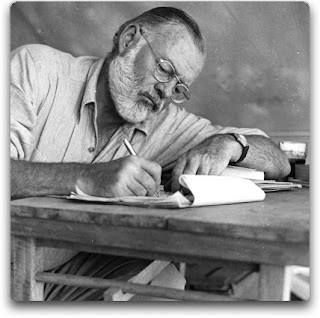 Hemingway used paper and a pen, a typewriter and a bottle, to create timeless literature. Today, with a cup of coffee and blog software you can start. Writing and being a writer are vastly different things. I have worked in radio, television, and online for quite a while and there are two camps in this world. The scared old-school bunch that is afraid of an open source user-created entertainment model. And the ever-growing group that understands we have the power to; create, contribute and share. That still doesn’t guarantee any of us are any good. Some say Ernest Hemingway was the greatest short story writer in history. That’s a personal decision. But forty years after his passing, his books are still sold and his work is still studied in the most respected schools on earth. And he did it without templates and software. If you have a passion, follow it with fervor. If anyone follows you, bonus.